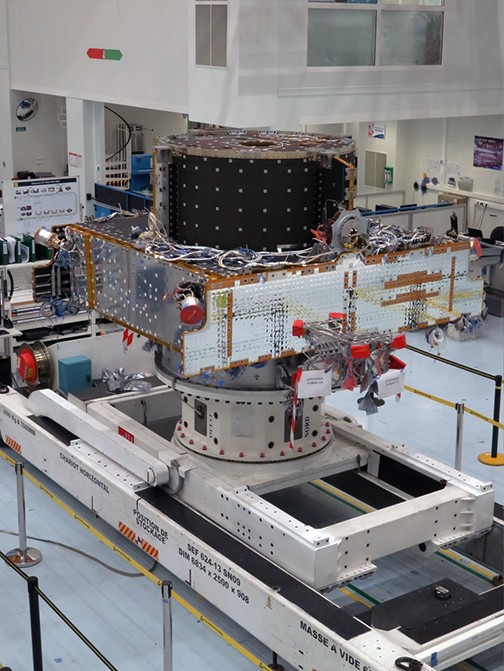 On December 27, 2018, Thales Alenia Space assembled the avionics and Xenon propulsion modules to form the service module of the first Spacebus Neo satellite, KONNECT, a high throughput satellite ordered by Eutelsat. The avionics module was built in Thales Alenia Space (TAS) facilities in Cannes and houses all the functions required to power, control and monitor the satellite. The Xenon propulsion module (XPS) was assembled in Belfast by Thales UK and shipped to Cannes in the week before Christmas. It is the structural backbone of the satellite and contains the electric propulsion system to both raise the satellite to its operational orbital position and keep it in place during its 15 years of operational lifetime. The resulting service module makes a perfect space vessel for the telecommunications payload, which will be installed onto it, fully tested, and then launched into space. After reaching its final geostationary orbit, the satellite will provide telecommunication capabilities customized to satisfy the requirements of the operator. Substantial schedule gains can be achieved thanks to the parallel production of these modules. In fact, lead time is an important decision factor when operators have to select the manufacturer of a satellite among various competitors. Through an innovative design and optimized industrial flow, the service module is standardized and can handle launch masses in the range of 3 to 6 tons with minimal adaptation. This service module packs the latest state-of-the-art equipment from all over Europe, with Spacebus Neo key technologies developed in France, UK, Austria, Belgium, Czech Republic, Germany, Ireland, Italy, Luxembourg, the Netherlands, Poland, Portugal, Romania, Spain, Sweden and Switzerland. The assembly took place a few weeks after the successful qualification testing of the satellite structure by RUAG in Zurich, which fully validated the mechanical design. The KONNECT satellite will allow the on-orbit validation of the complete end-to-end system of the new Spacebus Neo product line, including the fully electric orbit-raising phase. The new Spacebus Neo product line is developed in the frame of ESA's Advanced Research in Telecommunications Systems (ARTES) program, in cooperation with space agencies from ESA Member States, and managed jointly by ESA and CNES. The Neosat program comprises both Spacebus Neo by Thales Alenia Space and Eurostar Neo by Airbus Defence and Space. It includes development up to in-orbit validation of the new satellite product lines for both companies, allowing European industry to deliver competitive satellites for the commercial satellite market. Stéphane Lascar, Head of Telecommunications Satellite Programs Department in ESA said that the company is extremely pleased with the excellent results of our Partnership Programs such as Neosat. The results and feedback received from all parties is a demonstration of the continued trust that space industry, operators and national ESA delegations place in ESA for managing large-scale partnership programs. The involved European industrial partners benefit from maximized returns and opportunities resulting from the efficient co-management of the Partnership Programs, tailored to commercial best practices. Philippe Nabet, Thales Alenia Space Director of the Spacebus Neo product line added that the Neosat partnership program has allowed the company to develop the Spacebus Neo product line and its European supply chain. Thanks to Neosat, the company has been able to sell four satellites so far and are counting on many more in the years to come.